Nutrition is a very important topic during the pregnancy, lactation period and the startup phase of the foal. Too little attention or a wrong ration can have consequences. Hartog finds a good ration for the mares and foals important. Below we provide additional information and tips on nutrition during the rearing and lactation period. To support fertility, mares need a healthy dose of vitamins and minerals. Especially, vitamin A, as a shortage of it can cause poor fertility. Vitamin A is formed from the beta-carotene substance. Grass, lettuce and carrots are rich in beta carotene. Lucerne is also rich in Vitamin E and Folic Acid (Vitamin B11). Extra lucerne in the ration, such as in the Hartog Lucerne-mix, help increase the quality of the ration and support normal fertility. Especially in winter and early spring when the mare is not yet in the grass, extra vitamin E is desirable. Pregnant mares have had special nutrition in the last three months of pregnancy and during the lactation period of the new born foal. During that period, more protein and energy is consumed by the body. In the lactation period, the protein and energy need even doubles. During the pregnancy, the Hartog Lucerne-mix is very well used in the ration due to its high calcium content. The high content is good for the condition of the mare and for the bone formation of the unborn foal. The individual minerals are needed for the growth and development of the unborn foal. Together, the minerals support the digestion of the feed for example. Hartog's roughage feed grows on the rich clay soils and naturally contain a variety of minerals. A 600 kg mare uses an average of 1115 grams of protein (Vrep) per day in the first months of lactation. The average amount of protein (VREp) of a 600 kg mare that is raised recreationally is quite lower, with only 365 grams of protein needed per day. This means that the need for proteins in the ration of a lactating mare has doubled! Lucerne mix therefore goes well with the ration. Lucerne-mix can be perfectly combined with a merriebrok or colostrum. 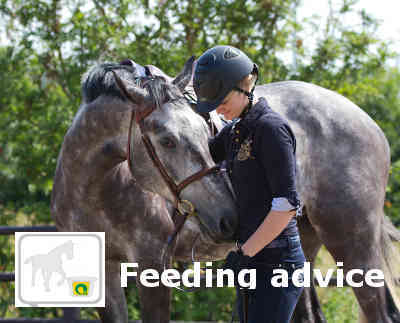 Often, the mare leaves the foal with food from the feed bin. As a result, the foal will get fiber-rich food at a young age. Intestines that begin early digesting healthy and fiber-rich foods are later able to digest the food very efficiently. Because of this, at a young age, a healthy intestinal balance is created. The foal is therefore less sensitive to eczema complaints and other intestinal related diseases at a later age. Especially for young horses, Lucerne mix is an ideal roughage feed as it is rich in calcium and essential amino acids, such as lysine and methionine for muscle building. In breeding, there are very positive results coming from feeding Lucerne mix during pregnancy and lactation of the mare and breeding of young horses. Lucerne mix has a high calcium content and contains folic acid and β-carotene which are essential vitamins for fertility. During the period of gestation and lactation, the calcium / phosphorus ratio is essential for the condition of the mare as well as the bone formation of the unborn foal. The high calcium content (3 times as high as hay) and the essential amino acids in the Lucerne mix contribute to the optimal development of the bone and muscular system. In addition, research shows that calcium has a positive effect on postnatal delivery.